You can assign one or more tags to images while uploading by clicking on More upload options... in the Upload Images panel and fill the Tags input field before uploading an image. It's on our road-map to support managing tags interactively through the Dashboard. You can now manage your tags interactively through your Dashboard 'Media library'. Simply select your image, and click Add tag to specify the desired tag for it. Is there an ETA on this feature? +1 ... as above I thought that I've found the perfect solution to our image management needs but without tag maintenance Cloudinary is one feature short. Thanks, that is helpful. But...need way to prompt/constrain through realtime tag name lookup/type-ahead...otherwise folks tend to make up tags. Hopefully coming soon? Thank you for your comment. It's on our to-do list. We now support automatic tag names completion in the Media library. Both when adding a new tag to a resource, or when searching the media library. I have updated some of my assets with a new tag but the search function does not find them. I tried deleting the other tags one of my videos had and keeping just one, in case that made a difference; still nothing. What do I need to do to get the tag search working? Could you please share with me how you tried to search for your images? I added a tag to the video file via the Cloudinary console and then searched for it. I can find the files that were uploaded with a certain tag but not the ones that had a new tag added after they were uploaded. Can you please open a support ticket here-https://support.cloudinary.com/hc/en-us/requests/new and share some more information about your cloud name, the videos you updated and the tag name you used. I believe the problem results from the delay in the new tag propagating across the database. Annoying but most likely the cause. Hi there, I have a question regarding tags. 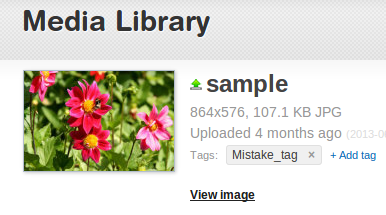 If I upload an image with existing metadata tags, will Cloudinary adpot those tags? Can´t find any article with a clear answer. 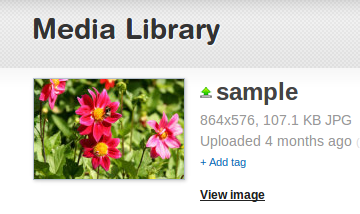 When uploading an image to Cloudinary you can add tags on upload or update the image later with tags. We don't keep the original image tags.